Thanks to Dave Lutz at Jones for chart. 2.The Rise of Populism….Since Brexit, the Pound has Weakened Versus Euro….70% of Revenue from FTSE 100 Companies is Derived from Abroad. Though a weaker pound might seem like bad news for UK stocks, about 70% of the revenue of the companies that make up the FTSE 100 is derived from abroad, meaning they make more money when sterling is weak. That is because the index is full of mining companies, oil firms, and pharmaceutical giants that use the UK as a base but tend to denominate their assets in dollars. Essentially, when the pound does badly, the FTSE does well, as evidenced by the near 15% gain in the index since it crashed on the day after Britain’s June vote to leave the European Union. 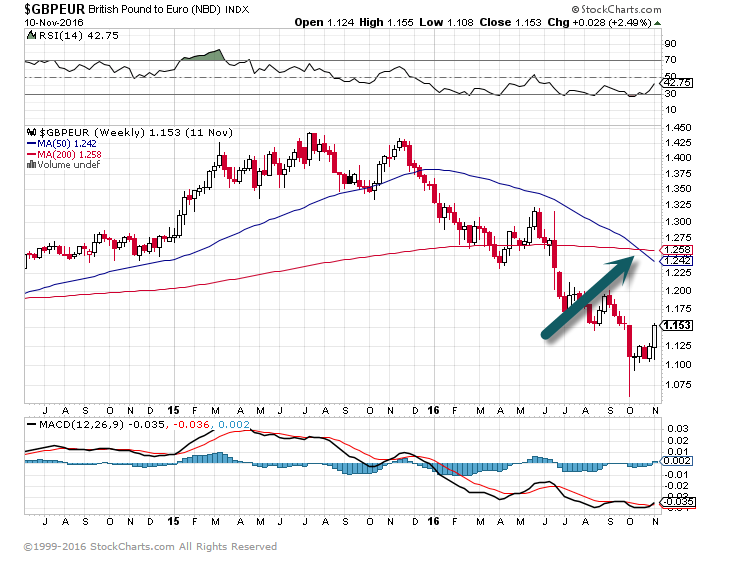 British Pound to Euro Chart….Pound Down 21% vs. Euro…50day thru 200day to downside. 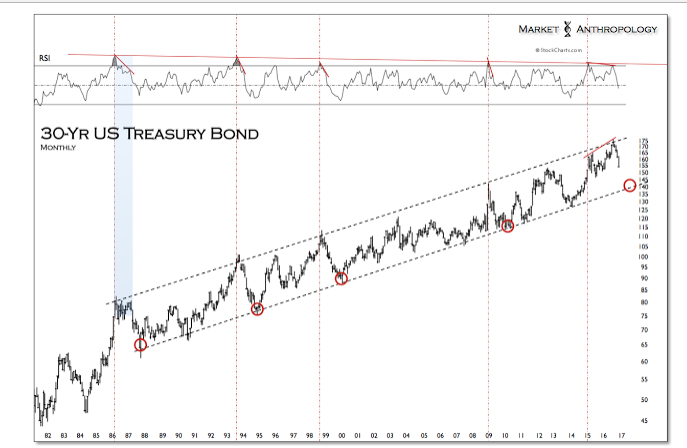 3.30 Year Treasury 35 Year Bull Run…Pullback in Perspective. 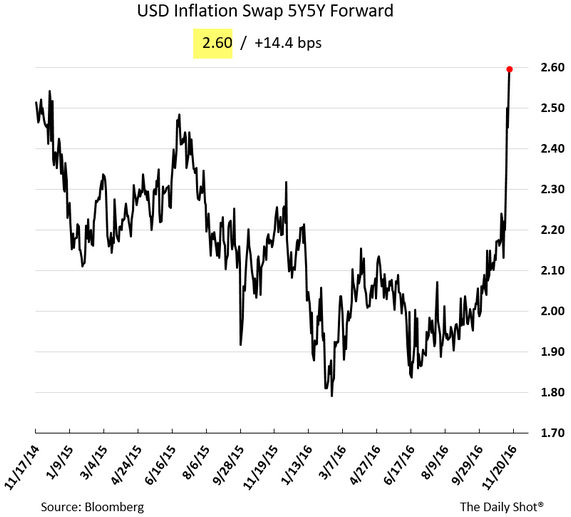 Speaking of inflation expectations, the US 5yr 5yr forward inflation swap rate is now at 2.6% – materially above the Fed’s target. 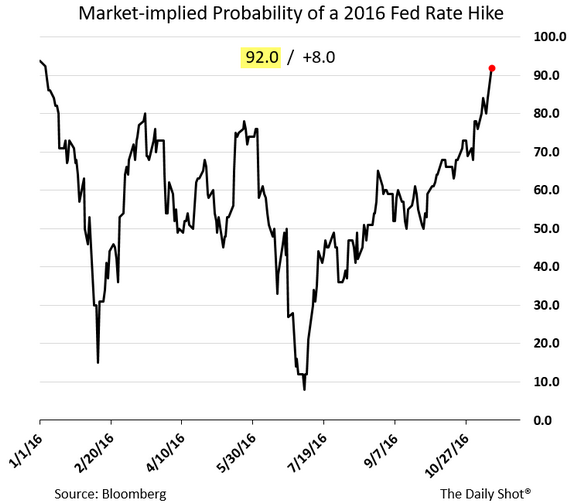 As a result of the above, the market-implied Fed rate hike probability in December is now at 92%. KRE Getting Overbought Short-Term RSI 84. Barron’s senior editor Jack Hough and WSJ’s Shelby Holliday discuss the latest issue of Barron’s. Topics include where to invest in the markets during the Trump administration. Also, is the the end of easy money? Plus, the price of safety. 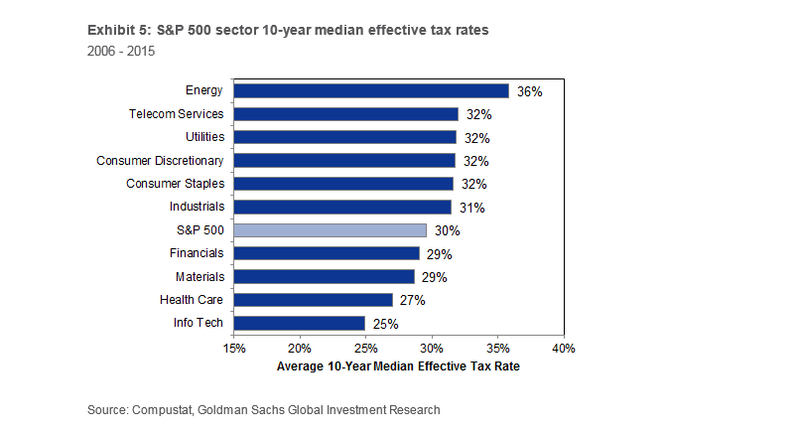 Red-hot earnings:According to the latest Factset Earnings Insights, the financial sector has been on a tear after reporting the highest rate of difference between actual revenue and Wall Street targets. Furthermore, financial stocks in the S&P 500 SPX,-0.14% that have reported third-quarter earnings thus far are averaging a blended earnings growth rate of 8.3% over estimates of just 0.2%. This is proof positive that the sector is humming. Valuation: It’s no secret that valuations are stretched generally across the market, with the S&P 500’s forward price-to-earnings ratio at about 18 now. In contrast, regional banks generally offer attractive multiples than other sectors. For example, Citizens Financial Group CFG,+0.84%sports a forward P/E of less than 14 and a price/book ratio of less than 0.8; KeyCorp KEY, +3.42% has a forward P/E of just 12 and a price/book of about 1.1. 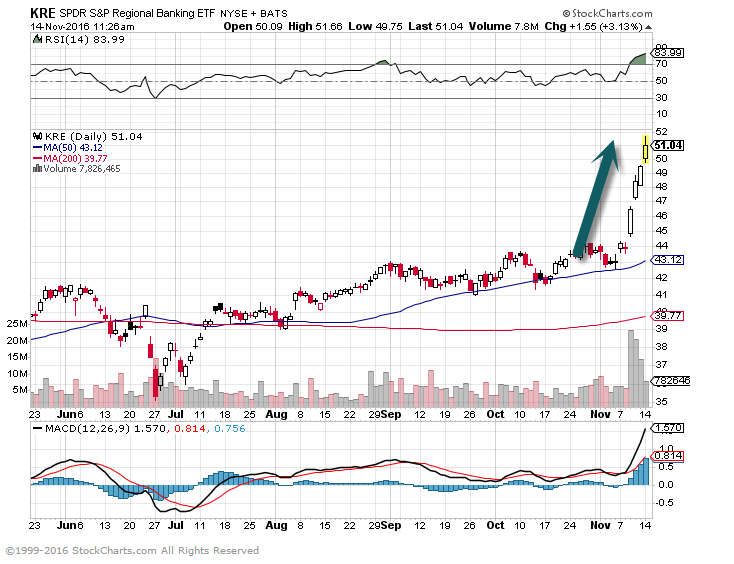 There aren’t many pockets of value these days, but regionals seem to be a rare opportunity in this overbought market. Higher rates:The inevitability of higher interest rates will help financials, but rates always seem to stay stubbornly low. The tide seems to be changing,, with the 10-year Treasury TMUBMUSD10Y,+5.76% up from a low of 1.32% in July to about 2.10% as of this writing. It’s no secret that Donald Trump talked strongly in favor of higher rates, or that some members of the Federal Reserve have been agitating for a more hawkish stance. The rates picture is indeed complicated, but all things being equal a higher interest-rate environment is better for margins at banks. Dividend growth:Banks now are universally in a better capital position than they were just five years ago thanks to changes in regulations. And while the Fed wasn’t eager to open the floodgates on dividend increases back in 2009 or 2010, there have been a host of impressive increases in payouts from regional banks approved by regulators lately. Consider Regions Financial Corp. RF,+2.22% , which went from paying 3 cents quarterly at the beginning of 2014 to 7 cents in its most recent payout. Even after more than doubling its distributions, however, Regions Financial is still delivering just 30% or so of earnings back to shareholders via dividends — a sign that even more increases are likely. It’s not just the income that’s appealing, but also the fact that these financial stocks are on firmer footing and seeing consistent and growing profits to support those payouts. 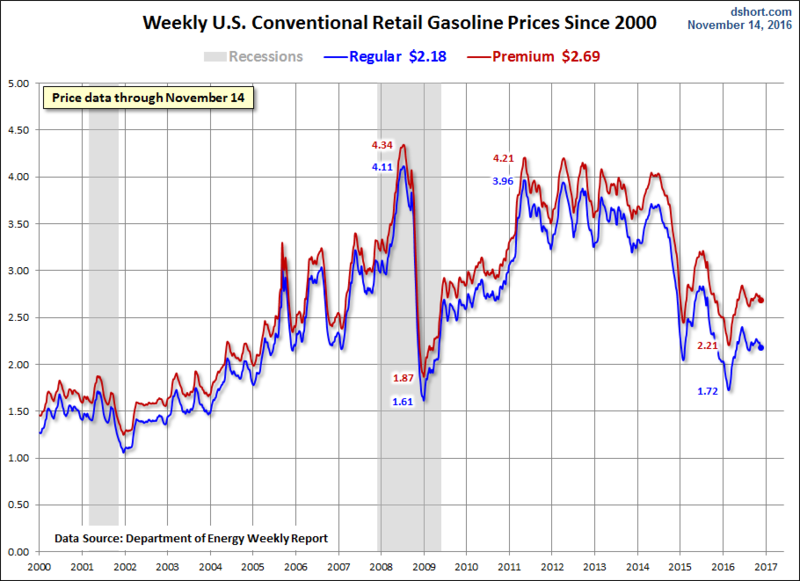 6.Gas Prices Below 2004 Levels….Rising Wages Plus Low Gas Prices? 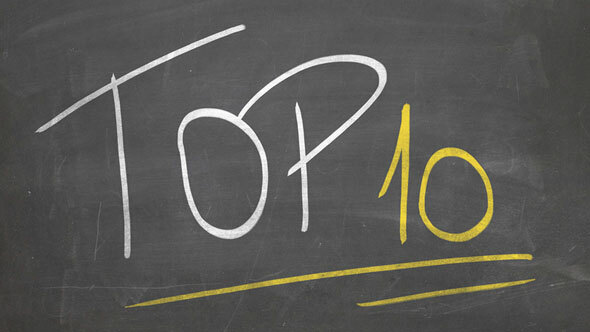 7.U.S. 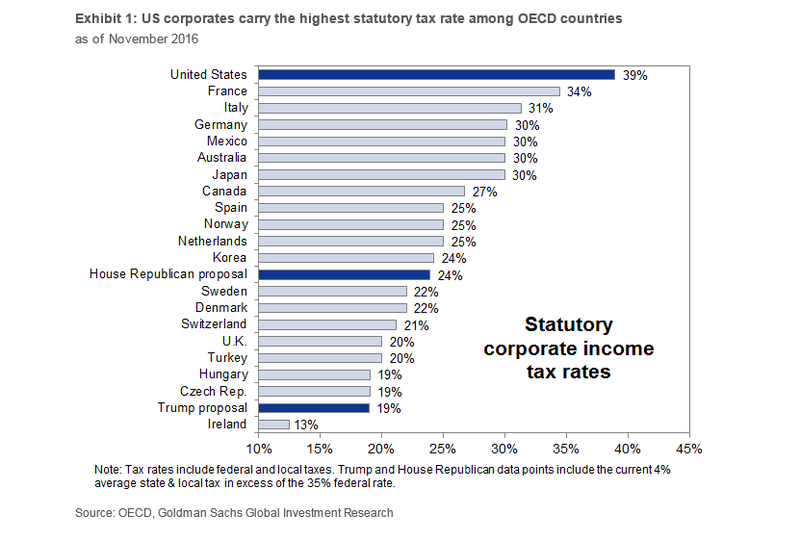 Corporate Tax Rates Highest of OECD Countries. 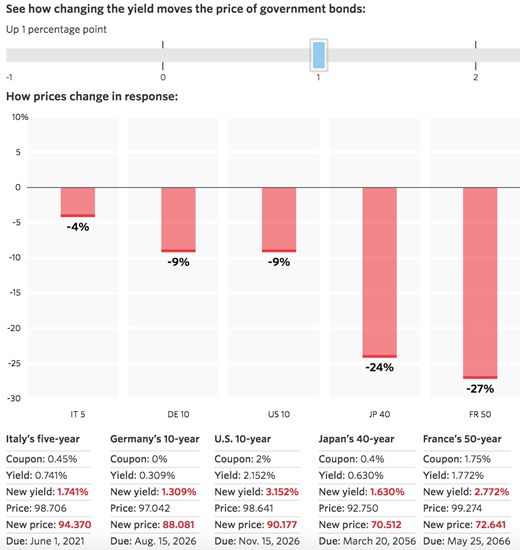 The Wall Street Journal has a useful interactive tool that can show investors how sensitive their government bond holdings are to changes in interest rates. Expected stock market returns a can be tricky to nail down, but bond returns are fairly reliable in terms of how they react to certain variables such as current yields and interest rate movements. The longer the duration and maturity of the bond or bond fund, the higher the variability of prices to changes in interest rates. This makes sense when you consider shorter duration bonds mature sooner, meaning you don’t have to rely as heavily on interest rate forecasts farther out into the future. This past week was a good example of how this plays out in the real world. The yield on the 10 year treasury went from 1.83% at the close of business on Tuesday and shot up around 0.30% to 2.12% by Thursday afternoon as investors tried to figure out what a Trump presidency might mean for inflation and interest rates. It’s still way to early to draw any conclusions about what this all means, but it is instructive to see how various bond maturities performed in this short window of rising rates. Again, the risk/reward relationship holds where higher yields tend to lead to higher returns (this is of course only a long-term phenomenon). And in return for this higher expected performance at the long end of the maturity spectrum you have to be willing to accept the possibility for larger losses. Fixed income investors have been worried about rising interest rates for years now. Some think we could finally see a sustained rise from current levels. 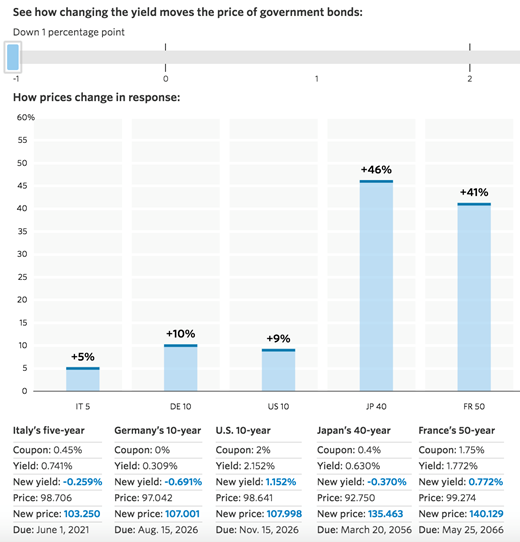 Like all forecasts, predicting the direction of interest rates is much harder than it sounds. No one can tell you where interest rates are heading or when they will start moving to get there. 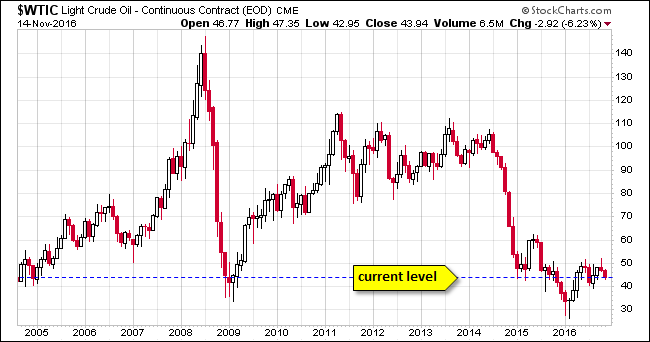 But I think the concerns of what happens to bonds from rising rates are probably overblown. Yes, bond investors will likely see more volatility and short-term losses than they’ve been used to in the past. But if interest rates just stayed at current levels forever, investors are assured fairly low long-term returns based on the current yields. That’s simply how bond math works. The only way bond investors are going to earn higher long-term returns is if rates rise so they can reinvest maturing bonds or new funds at higher yields. Of course, this means that they will have to experience short- to intermediate-term principal losses to get there. 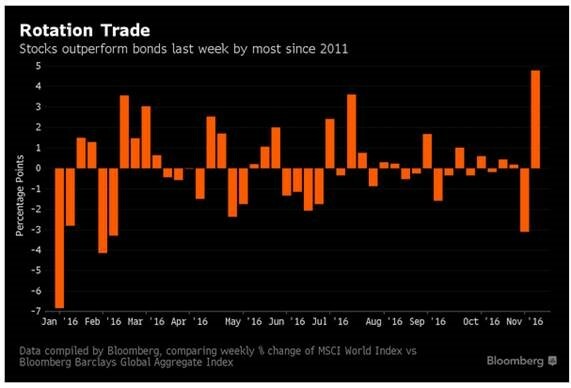 This paradox of short-term pain for long-term gain is the usual trade-off seen in the investment world, but something many bond investors have been spared for some time now. The size of those losses will be determined by the duration of your bond fund or portfolio. Higher rates are still not a foregone conclusion. Markets are never that easy. But if higher rates do finally materialize, investors should welcome this development, not fear it. The only path to eventual higher fixed income returns is through higher interest rates. If the future generation is going to one day successfully run the world, they’ll need a few essential skills at their disposal. Jillian Bayor, founder and CEO of college admissions firm Ivy League Essay and business school admissions firm MBA Ivy League, spent the college admissions seasons of 1998, 1999, and 2000 looking for the world’s future leaders as a Harvard admissions interviewer. “I definitely think students should be financially astute before they get to college and have at least read some books geared towards students on money,” Bayor says. “I strongly think there is not enough financial education in this country, especially for those who don’t learn it from their parents,” she says. “College, especially at the Ivy League level, can be stressful, and it helps to have the inner resource of being able to see things in a realistic way — to understand that a single bad grade on a test or paper is never going to make or break you — and that one doesn’t need to be perfect to succeed,” Bayor says.